"Tastes very similar to ones served in chain restaurants in our area. This one uses refrigerated Alfredo sauce as its base to give it a wonderful creamy texture." In an 8x8 inch baking dish, spread the roasted garlic, spinach, artichoke hearts, Alfredo-style pasta sauce, mozzarella cheese, Parmesan cheese, and cream cheese. 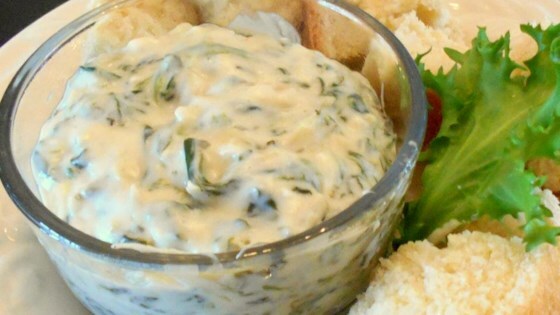 An amazing dip that’s as good as the original restaurant version. I kept this in a crock pot for a buffet and added whole milk a few times to maintain texture. No leftovers.